I got some things I wanted done this month but towards the end, I kind of wandered off and started picking things up as I felt like it. 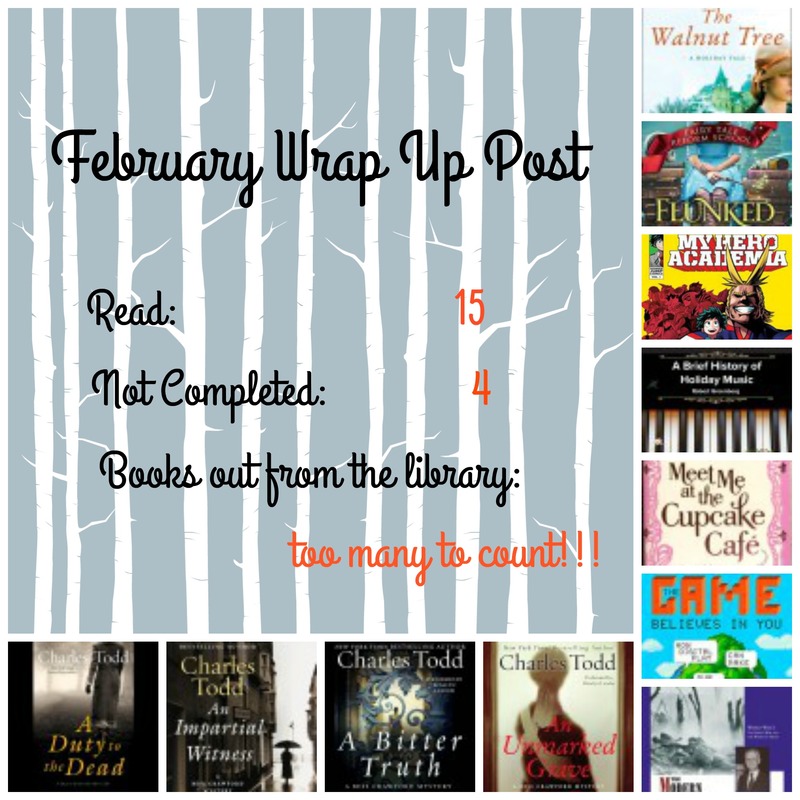 I'm going to try and get through some specific books in March. Reading progress update: I've read 61 out of 256 pages. There is soooo much information in this chapter! I quit bookmarking segments because they turned into multiples on every page. 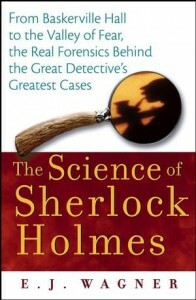 Several famous poisoning cases of the time period were mentioned: Madeleine Smith (whose courtroom scene was was sketched by Arthur Conan Doyle's father), Florence Maybrick (whose trial was marred by Justice James Fitzjames Stephen, descending into senility), Elizabeth Barlow (killed by an injection of insulin - the forensic pathologist spent two hours searching with a magnifying glass for the marks), and many others. A brief history of poisons and attempts to ward them off (beazors, etc.) and detect them is given. If you want to know more, The Poisoner's Handbook (not as deadly as it sounds - it covers Alexander Gettler and Charles Norris' work to raise forensic standards in New York City and beyond. 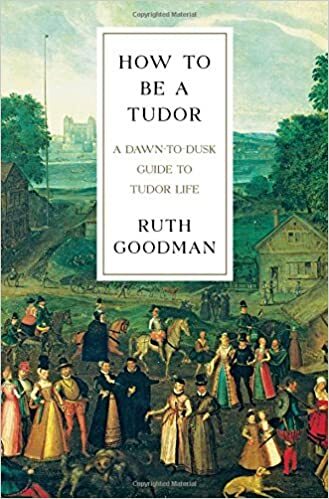 The chapter also covers the Smethurst case, which is credited with being one of the main reasons the field of medical jurisprudence languished in Britain while it took great strides on the Continent. The pathologist who ran the test for arsenic, Alfred Swaine Taylor, basically botched the test and had to admit it in court. Something I'd not heard before is the that some historians think Dr. Bell hide his connection to forensic cases, such as the Chantrelle case. I could go on and on but there are too many other chapters still to read. If this interests you, the above book as well as The Inheritor's Powder. A lot of this chapter has brought information from the later flooding back to me. Lady Elspath Douglas is in Paris keeping an old school friend company before the birth of her first child. Elspath's long had a crush on her friend's older brother, Alain, and he finally notices her...just as WWI starts. Our..."intrepid" hero's journey leads her across France in the early days, giving her the desire to become a nursing sister. But she's the ward of a very conservative uncle who'd never let her join - so she doesn't tell him and basically lies to get in. A love triangle develops...blah, blah, blah. 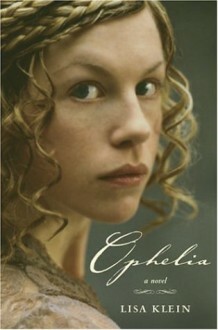 I wanted to like Elspath (though it could have been Bess!! Why wasn't it Bess?) but I never could quite connect with her. I think she's suppose to be independent and strong; I found her selfish and TSTL at times. She's suppose to be a great nurse; she lets worries and personal concerns take precedence. (I could talk here about the fact we've seen other nurses handle the same instances better...but that would make me sound like I'm blaming this character for not being the other one.) Elspath is suppose to be a character from an elevated position seeing the world change around her forever. She's shown to be okay with this; yet she flaunts rules, drops names and calls in favors, and seems to want the best of both worlds. While I never thought Alain and her were a good match, I'm frankly left thinking Peter's too good for her. I think she's clearly on a path of growth but the problems is we see little of it. And she basically does one of the worse rebounds I've ever seen. So...why am I giving this three stars? (I keep asking myself that very question.) In the end, the parts that worked...really worked. The historical aspects were well done and integral to the plot. They felt real and you could understand and feel them in a way it's difficult to in non-fiction. Some of the scenes where Elspath is growing and changing as her world changes around her are good and I absolutely loved the final part (where the story gets its name from). Am I glad I read it? Yes and I will probably even buy an ebook copy of my own. Will I read it often? Just as I was complaining about the love triangle the main character was selfishly continuing...I really didn't see that coming. Or maybe more hoped. I didn't want her to be with him (Peter's way better) but come on! Didn't see this going quite that dark! 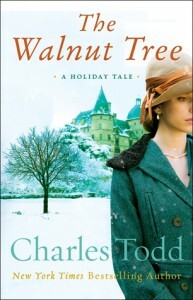 So the main character of this short story isn't Bess Crawford...and I'm finding a bit hard to care. Maybe that's horrible of me but I'm not really interested in Elspeth Douglas and the not terribly bright choices she's made along the way. I mean when French people are telling you to get the heck out of their country...you need to be on the first boat out. But no, she has to stay with her friend...and then proceeds to get in everybody's way as she suddenly must get back to England. She's engaged to marry someone without her family's approval yet likes another guy...seriously, this whole thing is a mess. Though I have to respect her for getting her hands dirty and becoming a sister. I'm not sure I could have. 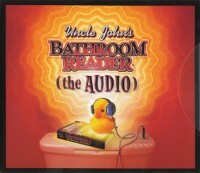 I was introduced to Uncle John's Bathroom Reader series by a favorite teacher in high school. 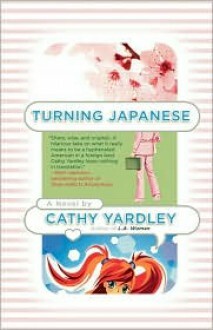 I was surprised at the information the books contained and liked the little quizzes that pepper the book. 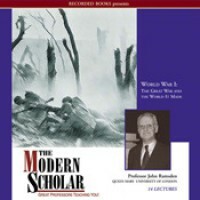 I own two books, one of them their history book, and couldn't say no to trying the audiobook. Like the rest of the series, this is broken into short facts, themed articles, and long articles. It covers everything from history, basketball, Uncle John's Stall of Fame (achievements that have to do with the toilet - surprisingly interesting), trivia, riddles, etc. However, there was some really good information in this version. I think my favorite concerned Gander, Newfoundland. The town and surrounding area took care of hundreds of displaced passengers when planes were grounded there on September 11th. They went above and beyond to find them shelter (there were not enough hotels in the small town), feed them, and even entertain them with trips to local spots. Quite worth the listen to learn about that. If you like random facts, interesting tidbits, and need something to listen to you can easily pick up and come back to later, this is a decent choice. There is a full cast, with each person reading different articles and random information. It helped highlight the different segments, rather than them all running together. I also quite enjoyed that I could listen to it for a bit, stop it and walk away for awhile, then pick it up without having to worry about being in the middle of chapter or thought. This has been awhile in coming. There never seemed time to input these new books we got for Valentine's Day. LL has Goodman's similar book on the Victorians but I've not read that one either. Shigeru Mizuki is an amazing mangaka (manga artist) who's well known Showa series tells the history of Japan before, during, and after WWII. I've started reading it through the library, so I'm interested to see how he handles Hitler. London was LL's present for Valentine's Day (mine was colored pencils for my adult coloring book!). I do want to read it...but it's kind of intimidating! I also got library holds today (too many!!!). That's not even counting the ebooks and audiobooks I have. Yeah. Juggling books again. I picked up The Blind Assassin thanks to BrokenTune's posts. I'm looking forward to trying it out. 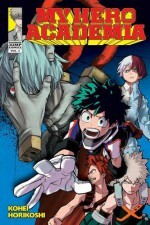 I read the first two volumes of My Hero Academia in December and absolutely loved it! Note: do not read the second book unless you have the third by your side. It has one of the evilest cliffhangers I've ever seen. I can not wait for the anime later this year! Turning Japanese and The Science of Sherlock Holmes are my attempt to start clearing up my Want To Read list from the library. We'll see if it works! 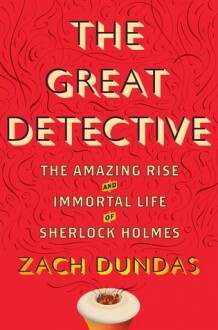 The Great Detective caught my eye as I was browsing and I learned about Ophelia from Grimlock's recent post. 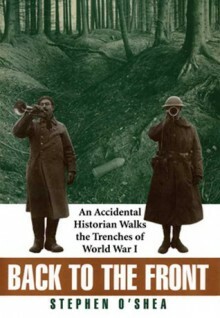 Back to the Front came from both wanting to clear some books off my list and listening to the Bess Crawford series as well as The Modern Scholar WWI lectures. So many books! We'll see if I can get through them all. I just saw this. I've not read him yet but LL really likes his books. 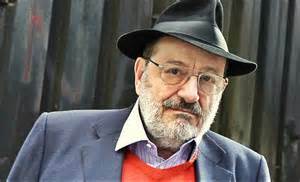 His last book hasn't been translated yet, apparently. For the next...not quite 24 hours, I'll be busy playing Splatoon! Every so often they hold what's called a Splatfest where the players break into two teams and play to win points. It's my first one and I'm very excited. I'll probably put a post up later about the game, which has kind of taken over my life but for now, I'm off to prove that Pokemon Blue is better than Red. I don't even like Pokemon. After Holiday Music, I was even more excited to listen to this...and I didn't think that was even possible! 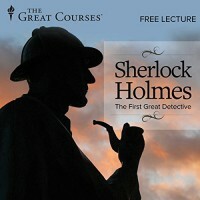 While most of the information was nothing new, Professor Thomas Shipley did an adequate job presenting a short but detailed introduction to Sherlock Holmes. I have to admit he wasn't quite as easy to listen to as Greenberg and I had to rewind a bit and relisten before I got use to his style. He did talk about the prolific genre of Sherlockian fiction, even telling one of his favorite series - The Lord Darcy series. I'll have to check it out. It was good enough that I might pick up his course Heroes and Legends: The Most Influential Characters of Literature, but it was already on my wish list from its name alone. I meant to listen to this in December but Christmas was...a very unholiday-esque and crazy time. This was free on Audible at the time and I had to try it. If it were longer (as it should have been! ), I'd have bought it in a heartbeat. 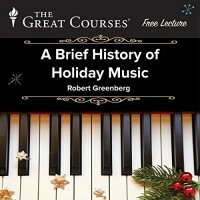 Professor Robert Greenberg was so easy to listen to and tied together "not" Gregorian chants, Handel's Messiah, and Tchaikovsky's Sugar Plum Fairy played on a celesta. The musical excerpts were wonderful and he used them well. Greenberg includes, as a treat, Sir Peter Maxwell Davies' Country Dance from Eight Songs for a Mad King, which begins with a...disturbed version of Handel's "Comfort Thee My People". It's...something I've never heard before. If you're interested to hear more, here are a couple videos I've found about it. Video with just the music. I may have to suddenly learn more about music. 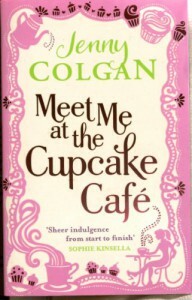 Meet Me at the Cupcake Cafe - And now I crave cupcakes! 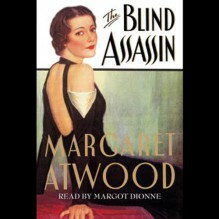 I happened to see Audiobook Junkie's review of this book and decided to take a chance. I'm so glad I did. I'm still not sure what to do with this book. 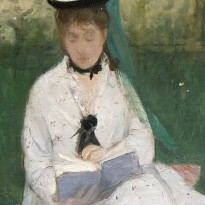 I don't read books like this. If there's no murder, history, steampunk, Sci-Fi...something, you need to work real hard to hold my attention. Yeah, I know I need to branch out more in my reading habits. Issy's (Isabel) life is in a decent place. A good job, a house with her best friend Helena as a roommate, her grandfather still alive though starting on the slippery slope of dementia, and in a secret relationship with her gorgeous boss, Grahame. Then one day, the dominoes start to fall. Her position is made redundant, her boss turns out to be a complete jerk (though why this was a surprise to her I have no idea), and she has no idea where to go next.